W. W. Norton & Company, 9780393285024, 384pp. "There are two keys to unlocking the secrets of American politics and American political history." 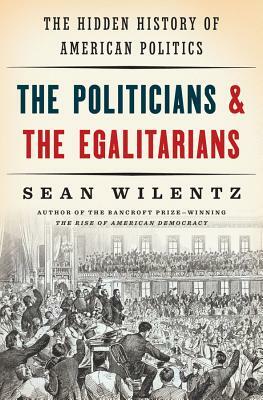 So begins The Politicians & the Egalitarians, Princeton historian Sean Wilentz's bold new work of history. First, America is built on an egalitarian tradition. At the nation's founding, Americans believed that extremes of wealth and want would destroy their revolutionary experiment in republican government. Ever since, that idea has shaped national political conflict and scored major egalitarian victories--from the Civil War and Progressive eras to the New Deal and the Great Society--along the way. With these two insights Sean Wilentz offers a crystal-clear portrait of American history, told through politicians and egalitarians including Thomas Paine, Abraham Lincoln, and W. E. B. Du Bois--a portrait that runs counter to current political and historical thinking. As he did with his acclaimed The Rise of American Democracy, Wilentz once again completely transforms our understanding of this nation's political and moral character.